The Eastern Meadowlark (Sturnella magna) is 9-11 inches in length and is in the Blackbird family. It is a stocky bird with brown-streaked upperparts, bright yellow throat and underparts, and a black "V" shaped "necklace." The tail has white on the outer edges. In the central United States where they overlap, the Western Meadowlark looks similar to the Eastern Meadowlark, but the western species is distinguished by more pale upperparts, yellow on the cheeks, and a different voice. 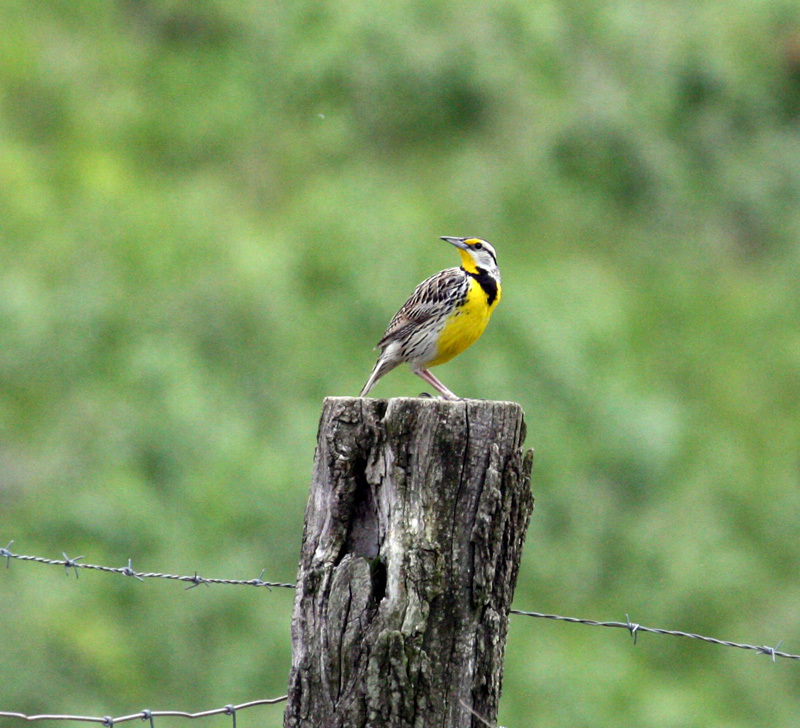 The Eastern Meadowlark is a bird of open field areas, pastures, and meadows. It is often polygamous with more than one female (but usually no more than 2) nesting in the same territory of a single male. These birds tend to nest in hayfields, so their nests are often destroyed during the mowing of the fields; however, they usually have a second brood later in the season. During migration, these birds tend to be seen in flocks of several birds in grassy areas or fields. The diet of the Eastern Meadowlark consists of crickets, grasshoppers, caterpillars, and grubs which they take by foraging on the ground. They feed by sticking their bills into the soil, opening the bills, and then eating any insects they may have disturbed. In the winter, these birds also eat seeds, corn, and fruits. 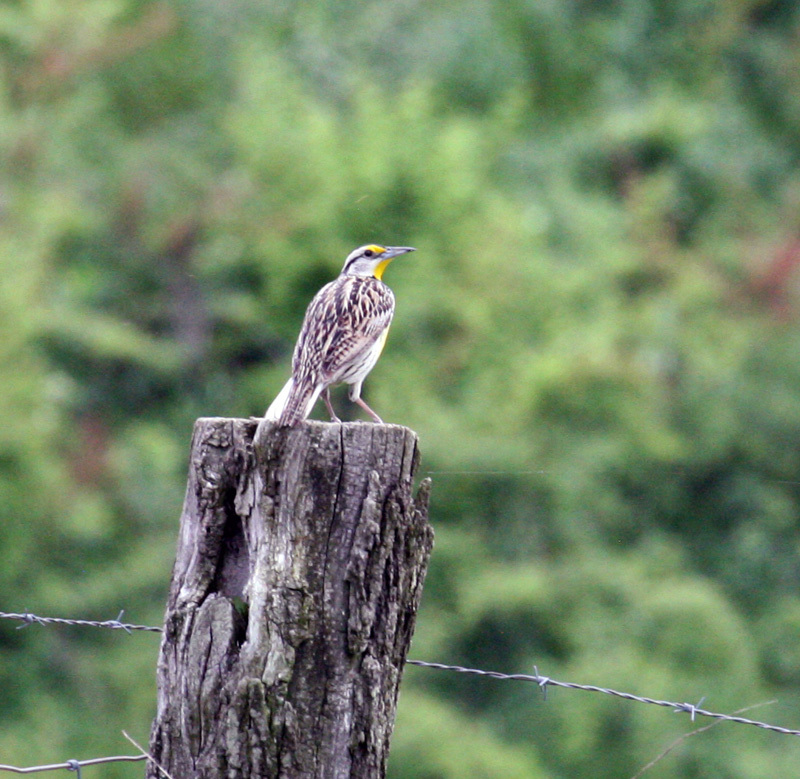 The Eastern Meadowlark typically sings from a conspicuous perch in its territory. The song can vary, but typically consists of 4 whistled notes that are slurred together into a sound that sounds very much like the bird is saying, "spring of the year." Click here for a range map and additional information. Click on the players below to hear samples of the Eastern Meadowlark's repertoire.